I can already tell you have good taste, after all, you chose the majestic Tulum to be the place to have your wedding! Or maybe, you just happened to find my blog about 5 reasons to have a wedding in Tulum. Either way, you’ve made an awesome choice. Mexico’s best-kept secret is quickly becoming more and more well known due to its gorgeous beaches, amazing bohemian atmosphere, and welcoming locals. After my first few hours in Mexico, I was already dreaming of where I might photograph a couple for a Tulum elopement. Knowing where to get married is one item off the checklist but there’s so much more to consider, it’s hard to even know where to start! I’m a newlywed myself so the memory of having to plan a wedding almost entirely by myself is still painfully fresh. Luckily, I get to share advice from my own experience as a Tulum wedding photographer, as well as my wealth of experience from being a destination wedding photographer for so many years. Here are a few pieces of advice I would’ve given myself for a Tulum wedding as well as tips on how to make the most of your time there! Being a travel blogger means getting to meet lots of different types of travelers, from ardent Hostel-goers to the expensive tastes of those who don’t consider anything less than 5 stars. As a Tulum wedding photographer, I’ve had the chance to enjoy staying in places nicer than I could even imagine as well as the dingiest hostels where I wouldn’t send my worst enemy, so I’d consider myself someone with insight on where to stay when abroad for a destination wedding. 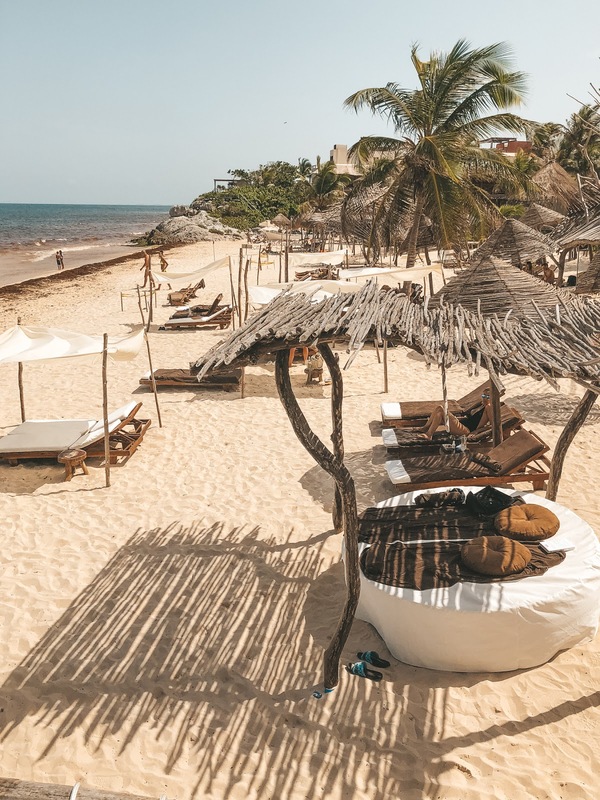 Depending on the level of comfort you’re looking for, and what your budget allows, here are two suggestions at either side of the price spectrum for you or your guests heading to the Yucatan for your Tulum wedding! The right hostel can give you the best of both worlds, a cheap place to stay and a great experience. This is where Casa Lum comes in: a well designed, cozy, and inexpensive stay in the heart of Tulum, a 15-minute drive from the beach. A handful of the staff here were travelers who came to Tulum and ended up staying or moving when they returned to their home country to have the opportunity to work in such a fantastic environment. If that’s not a testament to how great this hostel is, I don’t know what is! Hostels aren’t the usual choice for a wedding, at least not that I’ve heard of, but this one had me reconsidering my opinions on hostels as a whole. As a Tulum wedding photographer, there were several locations I could see a couple doing portraits at that would look just as good as an expensive hotel. If you’re looking for a modern, beautifully designed option that will make you feel at home, you will find it at Casa Lum. There are nice hotels and then there are resorts like Azulik which go beyond the textbook definition of luxury. The perfect place for a wedding party to kick back and enjoy before and after the big day, complete with an avant-garde cuisine, an incredibly well-cultivated spa, and tours through the jungle. Easily one of the best hotels I’ve been to in the world, let alone Mexico. One specific feeling I appreciated at Azulik was a constant connection to nature, unlike many luxury hotels in big cities – it was able to maintain the perfect balance between tranquil and yet still brimming full of jungle energy. For a destination wedding photographer, the idea of staying here while shooting a Tulum wedding is almost as exciting as the actual wedding itself! Another favorite venue in Tulum is Casa Malca (pictured above), which used to be Pablo Escobar’s mansion and is now converted into a beautiful hotel filled with modern art and so many unique elements. Casa Malca has a large property and so many areas to choose from for your wedding ceremony and reception, and would be an absolute dream venue! I’m writing this after just having a 45-minute conversation with a friend about her upcoming destination wedding in Seville, one of the wonders of Spain, the capital city of Andalusia, in the southern region of the country. One of her biggest issues when searching for a destination wedding photographer was uncertainty about whether to bring one from the US or find one in Europe, whether to hire a team or an individual, how far out of her budget she was willing to go if she found a destination wedding photographer she really loved and the list goes on! This gave me even more insight into how much consideration goes into choosing any photographer, let alone a destination wedding photographer in Mexico. Her questions are ones I’ve found to be important to the brides I’ve worked with, so I’ll be answering them below! There are so many pros and cons when faced with the choice of picking between a Mexican local or an “imported” destination wedding photographer, I may even write another blog about this topic in its entirety later on… but I’ll keep the list short for this one! A big pro of a local is hiring someone who has the most familiarity with where you’re having your wedding. For a Tulum wedding, hiring just about anyone from the Caribbean side of the Yucatan peninsula means getting insider info on the best places for portraits, a potential for better understanding of how certain venues operate, and other invaluable tips only a local could give. The biggest con of a local photographer can be a lack of options, especially if you’re choosing a remote destination for a wedding or elopement like Sri Lanka or Bali. A place like Los Angeles probably has more destination wedding photographers than there are even photographers in Sri Lanka, being that the city population alone is 70% of the size of the entire country and is far more developed. The reality is, it’s a lot more challenging to have your choices limited to the boundaries of the city you’re getting married in which is the biggest pro of bringing in someone from literally anywhere else. Flying out the photographer you want most in the world means having your exact choice and not having to compromise on how you want your Mexico destination wedding to look. A Pinterest search can only take you so far, which is where the biggest con for a foreign photographer comes in. I won’t downplay Pinterest, it has led me to some of the most beautiful destinations I’ve ever seen that I may not have found on my own, but they’re places that everyone else may have already used over and over again. On the other hand, that con could be mitigated or even erased if the photographer has spent a lot of time in a certain before. For example, now that I’ve shot a destination wedding in Greece, I feel like a pro when it comes to destination wedding photography in Santorini – not necessarily the entire country but definitely Santorini because it’s such a small island. So, you’ve found a photographer who checks off all the boxes on the checklist. Their work is phenomenal, it’s exactly what you’ve always imagined, and they seem like a great fit to be spending your entire wedding day with. The only catch is, they’re a few hundred dollars higher than budgeted, or maybe even a few thousand when you include travel… how do you decide whether or not it’s worth it to spend more than anticipated? Considering that your photos will be the only aspect of your wedding that essentially lasts forever has always been my biggest argument for why a couple should be willing to invest an amount higher than expected on a Tulum wedding photographer. I don’t know any couples who reminisce about the food they chose for their guests but I get messages from brides years after I shot their wedding on a regular basis telling me how much joy they still get from looking at their wedding photos. My friend getting married in Seville says she’s had to cross off a lot of American wedding photographers because she simply can’t afford the added fees associated with travel and that she would choose the first one willing to pay for travel themselves. My advice for those who have a stricter budget and can’t simply to decide to invest an extra thousand for the photographer is to see how flexible your potential photographer can be! If you’ve already had the chance to speak and there’s a mutual feeling of a good fit, there’s a high chance your destination wedding photographer wants to shoot your wedding as badly as you want them to. So don’t hesitate to ask if there’s anywhere the photographer might be able to cut back on to drop the price or any additional fees they’d be willing to pay themselves, as long as it’s not unreasonable. Trying to make it work has only upside potential and essentially no risk so if there’s a chance for a perfect fit don’t be afraid to ask! When you attended your friend’s beach wedding in Cancun, another great place to get married in Mexico, you noticed what seemed an entire staff of photographers and videographers and may have wondered with a sigh, “how many people do I need to hire… and how much will it be! ?” The truth is, you don’t need to hire an agency or an entire film crew to capture a beautiful wedding. There are instances I’ve seen when a single Tulum wedding photographer has been able to deliver higher quality photos than a team of 4 people! I’ve also noticed that too many people trying to get the same shot not only be inherently unnecessary but can also lead to a dip in quality or frustration about getting in each other’s way. The most I could ever justify is a second shooter, which more often than not brings copious amounts of value to a wedding. It’s usually not too much more to hire a second shooter, and if you’re already spending thousands, it’s more than worth it to make the small leap to get an entire second perspective. Be wary of a destination wedding photographer with a crew unless you intend to spend half your wedding budget on photography! Of course, the exception to this rule would be for a Tulum elopement, wherein virtually the entire budget is spent documenting the event. In that case, if you can afford it, get the best Tulum elopement photographer you can find! At the end of the day, it’s hard to wrong with a Tulum wedding. Unless a tropical storm strikes your wedding ceremony, there’s little that could get in the way of a memorable day for you and your guests. I haven’t heard any horror stories from a Tulum wedding photographer about something going wrong so badly it ruined the wedding, so even if something does go wrong, have no fear! If you’re here reading this, it means you’re doing research and you’re already headed in the right direction in the planning and decision-making process. Ultimately, there are only so many questions a destination wedding photographer can answer, even one who’s shot over 100 weddings so keep digging or reach out if any questions have been left unanswered. A beach wedding in Tulum is a fantasy for some couples, so if you’re envisioning the perfect getaway, I can promise you will not be disappointed. Tulum is such a magical place, a jungle haven that often leaves people different than when they arrived. Answering questions or giving advice for those still in the early stages of planning is something I consider a privilege and would be happy to go further in depth for anyone who may need it! Whether a Tulum destination wedding is one of a dozen locations still being weighed or if you’re ready to book a Tulum wedding photographer, I encourage you to reach out by filling out a form submission or to my direct line, 786-270-8527 with any questions or comments.